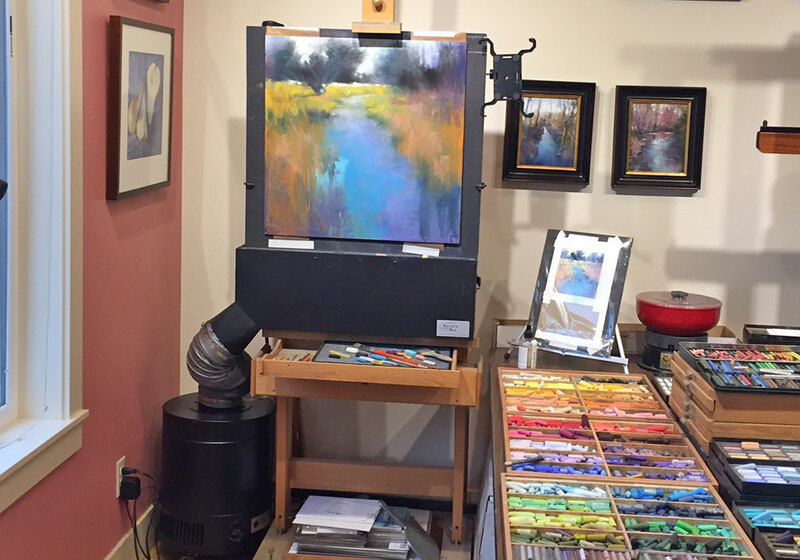 Weeks ago I had a request from a collector for another 6x6 pastel to hang with her previous purchase. I told her I would be painting more 6x6 inch pastels in March. Um...right. Gardening happened and here we are in the last days of the month. Desperate measures and focus needed. I cut four 6x6 pieces of Ersta 500 from a larger sheet and was left with two 4x6 remnants. 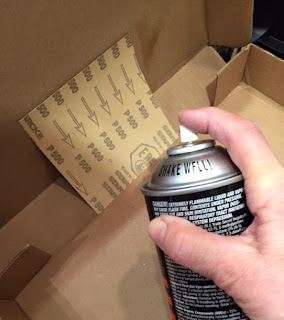 Set up a little cardboard box spray booth (use archival spray), mounted the Ersta on archival foam core. Took the panel with me to my Friday painting group*. 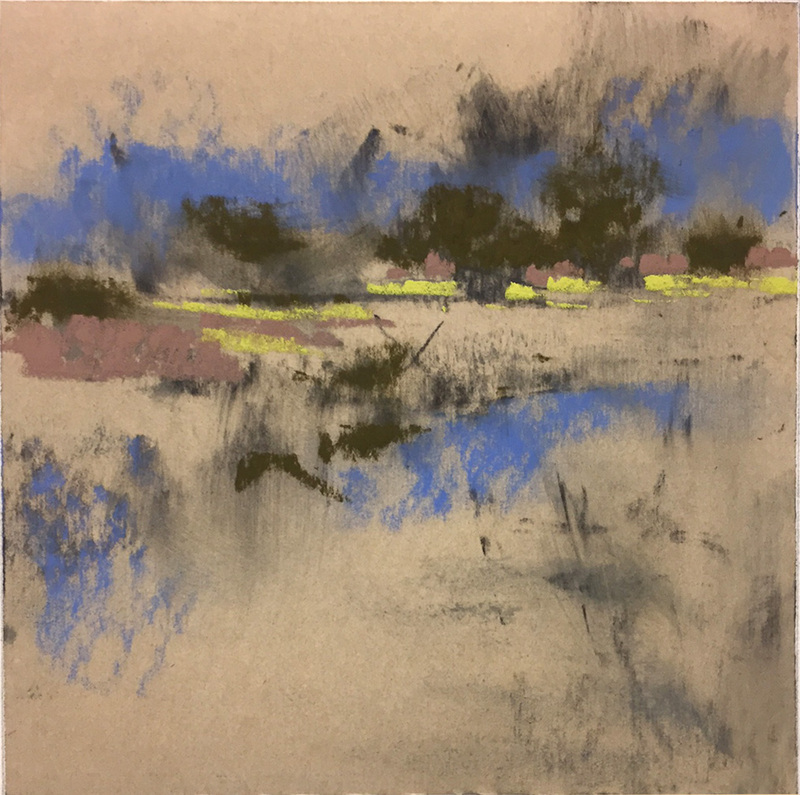 Still smarting from my kaput Ersta experience (see my previous post), I decided to use minimal pastels and let the color of the paper show. I started with vine charcoal, gave it an alcohol spray to set it. On some pieces, the charcoal ran or I brushed it around. 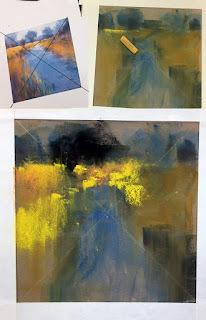 Basic first strokes can be seen here on the 4x6 "minis." 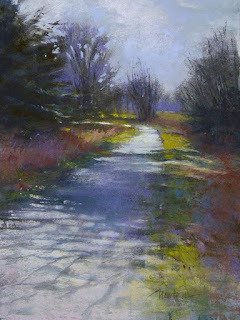 * Friday, March 31st, 1:30 PM I'll be demonstrating pastel at Maple Valley Community Center. After the demo we'll all paint together, any medium. Join us. On the easel today, Twilight II, pastel, 6x6 inches. It began with an oil wash then pastel. 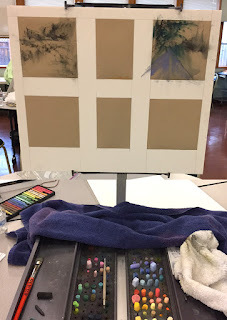 I took it to my Friday afternoon painting group and put pastel on and wiped it off for a couple hours. Back in the studio I did the same. 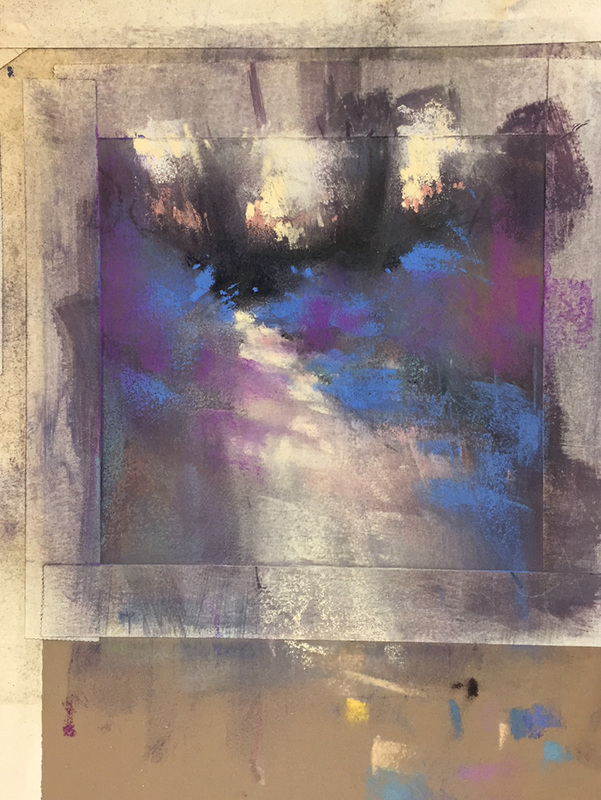 Finally, to avoid ripping it up, I punched it up with blue Nupastel, a warm violet Unison and a warm white Terry Ludwig and then I turned it around and walked away believing I would be throwing it away the next time I saw it. But, apparently, absence makes the heart grow fonder because after four days of gardening I'm back in the studio and my first impression is hmmmm....instead of aaarghhh. There might be hope. 3/25/17 The rest of the story... There was hope, then no hope. Back and forth. I finally had to admit that the Ersta 500 paper was kaput (broken and useless; no longer working or effective) and I trashed it. 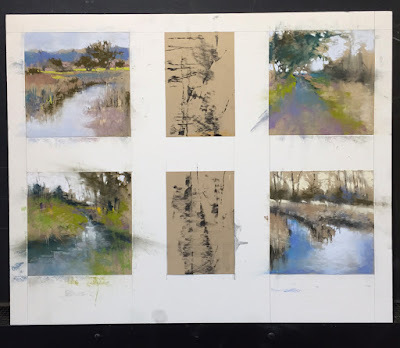 How this painting began...click on the image to view the videos. 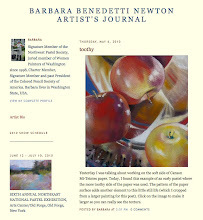 I just finished packing up seven paintings to deliver to Attic Gallery, Camas, WA. Suddenly there is a big blank space on my Studio wall that makes me want to paint scenes to fill the space. Originally I hung paintings in the studio because of a lack of storage space. I enjoyed them but after just removing seven, I realize the paintings had actually become just wallpaper to me. Two of the paintings were painted for my book, "Pastel Drawing" and are the subjects for page 139. I would like to send them off to a new home. They are both available on my DailyPaintworks Gallery. Switching my eyes and brain from my 6x6 inch color study to the 25x25 inch pastel on my easel requires stepping back, leaving the room, reentering with my eyes on the easel, etc. 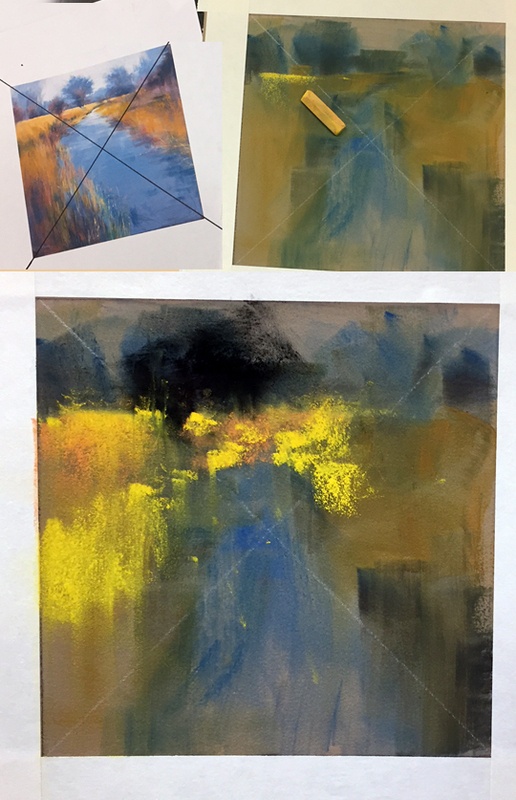 Another tool is to photograph the work in progress (shown above on right) and place the photo beside the photo of the color study with both the same size. Now I can see some shapes and compositional signposts I need to correct in the larger painting. An even more useful look is comparing the two paintings as value only. Without the distraction of color, this comparison is very helpful for composition and directional elements. It's good to check up on myself so I stay on track with what I'm trying to accomplish. 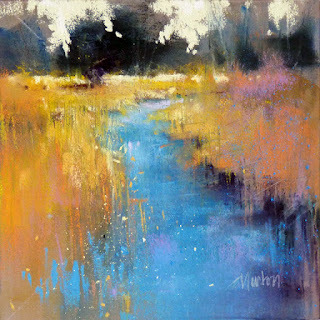 For those of you just tuning in, I am repainting Golden Afternoon II. I'm using my 6x6 color study as my reference (see it to the right of my easel in the photo above). When I started working on this painting, I shot short videos of each step but soon I got involved in painting and forgot to make more videos. 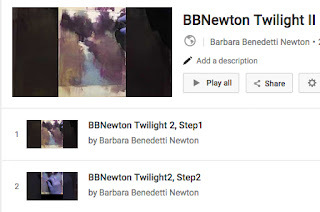 If you would like to see the first five steps, the links to videos are below. Once you watch one video, you should be able to find the others on my YouTube list rather than coming back to these links. 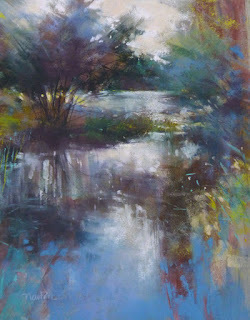 First I brush off as much pastel as possible with a cheap "chip brush." I can remove additional pastel, especially in the lightest areas with an alcohol spray and a cotton cloth. 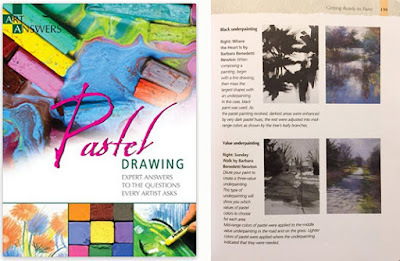 With a hard pastel I lay in yellow areas (NuPastel brand). OR...This is the link to all five videos in one Playlist.